(TB2H1VF) Cachin' Crow Geocoin - Todie's Wild Ride PC: Stop It! Todie's Wild Ride PC: Stop It! Use TB2H1VF to reference this item. This mission of this coin is to raise awareness for motorcycles sharing the road with other vehicles and the knowledge of how your motorcycle reacts to braking. Todie's Wild Ride, Dedicated to the memory of Tod Phillips! According to the Hurt Study, in the single vehicle accidents, motorcycle rider errors were present as the accident precipitating factor in about two-thirds of the cases, with the typical error being a slide out and fall due to over braking or running wide on a curve due to excess speed or under-cornering. Braking is probably the most important action that a rider can perform. Braking allows us to quickly slow down and come to a stop before hitting an obstacle. Most riders do not fully understand the distance that is required to bring the bike to a full stop. Braking distance increases with speed, and unfortunately the increase is not linear. Any reduction in the speed you are traveling will decrease enormously your braking distance. Motovike.com provides us with the following chart. Refer to it for a clear idea of braking distances, but be aware that this chart doesn't include your perception/reaction time (which will increase your braking distance considerably). Proper usage of the front and back brakes can be the difference between life and death in a close situation. In a normal situation, braking is pretty straightforward. Unless you are on a slippery surface, use both brakes to stop or slow your motorcycle. Be aware that the front brake provides 70 to 100 percent of the stopping power of a motorcycle. With that in mind, you want to practice using more front break than rear. An ideal situation is to have a balance between the front and rear brakes, with about 70% of the emphasis on the front. 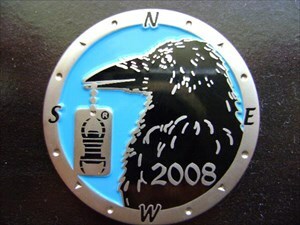 This is a personal coin and the only way to discoverer it is to meet us in person. We will bring it from event to event and from cache to cache to remind people about motorcycle safety. 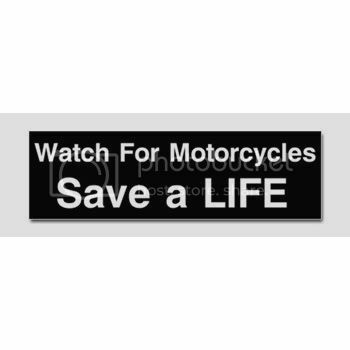 Please help keep our roads safe and watch out for motorcyles!! Gallery Images related to Todie's Wild Ride PC: Stop It! Discovered at the 10-10-10 event. Love the crow, and thanks for the info on motorcycle safety! I am running behind on my logging. I discovered this at the 007 Year No Itch event. Thank you for sharing. Discovered at "10 years! River Park FL" but was slow in logging. Thanks for sharing.